Let me begin by admitting that this is an unabashedly biased review — I LOVED Ghoonghat! A beautifully penned story by Mohammed Ahmed, superb direction by Mehreen Jabbar, stellar performances from Bushra Ansari, Mohammed Ahmed and Mansha Pasha, excellent cinematography by Naveed Malik, and the fantastic setting, all added up to make this one a surefire winner in my book. There might have been slip ups here and there but nothing that stood out like a sore thumb. Even though I watched the version without any background music, fancy editing or even credits, lets just say that I was so into the Ghoonghat groove that nothing could mar my thorough enjoyment of this fabulous telefilm. Strongly reminiscent of the PTV era simplicity, Anwar Maqsood’s brand of witty but meaningful writing, and Mehreen’s circa Kahaniyan storytelling, Ghoonghat is one of those gems that are becoming increasingly rare in this era of TRP driven productions. Building on the literary analogy of a ghoongat this story revolves around a bickering middle aged couple who have made it their life’s mission to argue and disagree with each other about everything and nothing. What makes this one a standout is how exquisitely the writer and director trace the journey of this couple, from being constantly aggravated to grudgingly accommodating each other’s quirks. Unbeknownst to themselves, over time this couple has become so habituated to each other, that all those things they think irritate them, are the very things they miss the most when they stop talking to each other. Ghoonghat is about learning to accommodate each other’s idiosyncrasies, learning to live together and veiling each other’s shortcomings. This also a story of giving each other space, not in the physical sense, but a mental space, one which allows others the freedom to be themselves. This one is about accepting each other for who they are, without needing to always have the last word. Even as Ghoonghat is a delightful commentary on marriages in particular and relationships in general, I could not help but be reminded of the problems that beset us as a nation. Be it religious, ethnic, linguistic, or socio-economic, we have failed to accommodate difference. Much like this couple, rather than gelling together and taking pride in a singular identity, we continue to fight among ourselves. So busy are we in these pointless games of one upmanship that we fail to see how these differences are not only ripping us apart, but have also left us vulnerable to outsiders. If only we could pause for a bit and think through our issues, we too would realize that after six plus decades much as we talk about nasli and lisaani tazad and tafarqqa, somewhere along the way we have become a unit. There is way too much of history tying us together. High time we put our differences aside and grew together as a stronger whole. 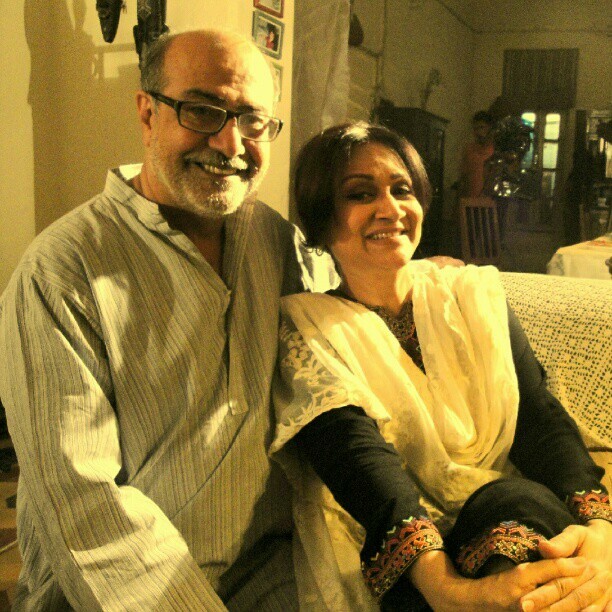 Back to the telefilm, Mohammed Ahmed and Bushra Ansari were fabulous as the middle aged couple. His underplayed character was a perfect foil to her slightly over the top performance. I do wish though that Bushra had gone easy on her cakey makeup. Mansha Pasha looked lovely and nailed it as Sabeen, the beleaguered daughter caught in the crossfire of her parents’ never-ending battles. I hope we continue to see her in other similarly substantial roles. Mehreen Jabbar’s direction was spot on and did more than enough justice to the brilliant script. Naveed Malik’s cinematography added a whole other dimension to the story. And, a huge shout out to whoever was responsible for the selection of that house – what a beauty! The fact that I so enjoyed this one without any background music raises the question yet again: Do we really need to have blaring music for each and every scene? I have nothing against the aesthetic and judicious use of music to enhance the narrative, but the fact that it usually tends to drown out dialogues, and more often than not does not jibe well with the happening onscreen, makes me really wish that production companies learn to go easy with the overuse of music. Here the story was absorbing enough on its own merit that I for one did not miss the music at all. Its been a while since I’ve gone this gaga over something on television; is it just me or did you all enjoy this change from the routine as well? Do you think we need more stories like this on our screens? Waiting to read your responses! I would like to thank you SZ for recommending me this master piece by Mehreen and Ahmed sahab , the script was screaming that I am from M.Ahmed ‘s Qalam !! I paused and rewind many times just to enjoy the dialogues again and again . I was totally in awe of the location and the camera man , he did justice with the script and Mehreen’s vision … The best long play after a long time . Mansha was amazing , I am really impressed with the way she portrayed the character so eloquently and with such ease . I agree on BA’s make up and also despite being brilliant over all she was bit over on few ocassions . @Sheema: Thank you for watching this one my recommendation – I’m so glad you enjoyed this one, warna tum daanti ke waqt kyon zaaya karwaya 😉 Indeed, the dialogues were all worthy of a second/third listen. and yes, Mansha was really very good! After watching ” ishq Wala love” even the biskut ad would be a better watch , so this drama came as a God sent gift for a boring evening !! I am a believer in magic of Directior ! A director can make an ordinary automatic camera operator , take extraordinary shots !! I loved it ! I actually put a reminder to watch this. Why can’t there be such sensible dramas ??? Thanks for this SZ. I would have missed this otherwise. Witty dialogues, fantastic script and amazing acting by Mohammad Ahmed, Bushra Ansari and Mansha Pasha. It was great to watch Mansha after a long time. She had disappeared after ZGH. I hope we get to see her more often now. Mehreen’s Direction was as usual superb. After the crappy dramas and serials being aired these days.. this was like a breath of fresh air and reminded me of the golden era of our drama. I fell head over heels in love with the cute couple. @pkk: Hey! Welcome to the blog 🙂 Mansha actually has been in quite a few projects but they have not attracted too much attention. I know that she was in Mafiha Maliha, Shab-e Arzoo ka Alam, and Be-reham, a single play in the episodic serial Kitni girhen baaqi hain.. there might be others as well that I dont know of … but yes, this was a strong character and she did do justice to her part! And yeah, Ahmed Sb and Bushra Ansari were cute together … btw, have you seen Coke Kahani? If not you should definitely check it out. I called Ahmed Sb and Shamim Hilali as the pair who would give the toughest competition to the Khirad and Ashar pair! Great review. I was waiting for this , I enjoyed it.mahereen jabbar is wonderful director . It was good to see Mansha Pasha , hope to see this kind of drama ,feels good after watching. Thanks SZ. @anjan: hey! Lovely to hear from you on this thread as well.. welcome to our little DRnR group 🙂 Exactly, I too walked away with a smile on my face .. it was so good to watch something lighthearted but meaningful after a long time. hi Sz i wanted you to recommed me some dramas of adeel hussain.i watched daam and matae jaan and loved both of them.. can you tell how was his drama called Mora piya..if you have seen it. @Hina: Mora Piya is one of my faves, but I have to warn you it is a single track story and many didn’t like it b/c it was too slow. You might like his Mera Naseeb more than Mora Piya. His Silvatein was good up to a point, then lost track towards the end. Jiya Na Jaye is his other recent serial, but I found it almost impossible to watch. He does have a new serial Shuk, starting tomorrow on ARY actually. Rest of the cast includes Sanam Saeed, Ayesha Khan and others. Thanks for replying SZ.. I was going through a few reviews of mora piya and it stated that it was an art drama and a mature one..is it true..because if that is the case i like mature love stories.. Thanks for the recommendation. I LOVED it! very reminiscent of old PTV! Thanks Mehreen! Can we please request you and Mohd Ahmed Sb to revisit Kahaniyan?! This is a very well written review of a beautiful play. I love script-driven plays with deep meaning that are punctuated with good humor. (The scene with the sneezing cracked me up)! The only minor criticism I have is that Bushra’s intellectual pause to reflect about life and writing appeared a bit out of character for what we had learned about her until that point. That being said, Mehreens attention to detail and the acting of all 3 main characters was excellent. Kudos to Mohammad Ahmed for the script, it’s much harder to write a short play than a long one. Your review is a perfect. in fact, Ghoonghat was a breath of fresh air and a cadence of storytelling was nicely presented among ill crafted cinematography where access of continuity jumps and lack of acting beats are aired now a days. Both writer and director exquisitely bring the conflict to life. There was a saying “Miss the simplicity of early PTV plays.” I think, setting is the actual part which is mostly missing in contemporary play, but here in her play she eloquently illustrated and time traveled her viewers and developed a certain mood and tone. Moreover, both lead characters and their characterization were so engaging (رچاؤ) that they will remain for good among uncle urfee to kabacha to rozee. Tone and mood was fine for a middle class family along with costumes to fixtures . Whereas, camera and cutting are concerned they were brilliantly crafted. Lastly, one thing I noticed that’s my personal opinion , a little improvisation at Sameer part was required because Mansha Pasha (hope this is the actor name) performed well comparative to him and she know how to use her body language well enough. Over all, Mehreen know the skill to let people stick to their couch . I will watch Coke Kahani if you recommend it. Has the script been written by Mohammad Ahmed Sahib? I love such cute couples. They remind me of Bua who was our neighbor and her husband when I lived with my parents. I had loved Mansha in ZGH and so did all my friends. So, was surprised that she did not come in any other major serial. Now that you have mentioned all these names, I suppose they were minor roles ??? I hope she comes in better and bigger serials. She has a lot of talent. I loved the colors and clothes she wore for this character. Very appropriate. Made her look dignified somehow. What do you think of Aseerzadi?? I notice you are not reviewing it. I find it to be nauseating! Re: Aseerzadi, I actually enjoyed it in the beginning, but now a potentially dark complicated story is reduced to a Disney type story with bright colors, simple good vs bad binaries, a harlequin type love story that has no place in the narrative … needless to say Im disappointed, I had really wanted to review it, but my time constraints make it very difficult to do more than a couple, if that, reviews per week. @Annie: Thanks for visiting, reading and commenting – much appreciated! Only you could do justice by writing such a fab review for an exceptional telefilm! Kudos to you for that and for the great intro. Ghoonghat definitely brought me back to the Anwar Maqsood and PTV era…ahh the good old days! I enjoyed the subtle humour, the quirky dialogue and the stellar performances. Thanks again for uploading the video! Thanks Nadia! Coming from an excellent writer like yourself this means a lot – much appreciated! Aangan terha! Thats what came to my mind. Thanks for uploading this. This was just superb! They reminded me of my dada and dadi.. Miss them! I just recommended it to loads of ppl. I also watched Talkhiyan last week. Saw ur recommendation for that. When I first realized it was based on the book, I wasn’t quite sure… Thought it would be pretty dark and gloomy,..but it was lovely to watch. Will be watching Coke Kahani next..Just read ur recommendation in the thread..
Have you watched ‘Tum Ho Ke Chup?’ .. I stumbled across it recently..Ok maybe not exactly out of this world stuff, but I loved the accents, the costume, the poetry in background sound and the farsi (Although I didn’t understand it, it just sounded so beautiful) & Hina was just brilliant!. For me that’s gotta be Hina’s best performance. @FA: Glad to read that you enjoyed this one .. Such plays are so far and few in between that one feels almost compelled to share it with like-minded friends 🙂 Yes, Talkhiyan was another one one that I absolutely loved. Coke Kahani is another different kind of a genre defying serial, short and sweet it was only thirteen eps and went by so fast ke had nahin. Do let me know what you think.. we do have a Coke Kahani thread.. so feel free to share there if you’d like. Yes, Tum Ho Ke Chup was another one where Hina B was brilliant. Even thought the story kind of meandered after rraching the midway point, but Hina and her persian were flawless. For a while I used t think that Hina was a native Farsi speaker, till she told me otherwise. Wasn’t that scene, where she steps into the grave with her book of poems, really spine chilling? It still gives me the creeps when I think about! @SZ Watched Coke Kahani.. Oh its lovely! Reminded me of the tanhaiyyan, unkahi, dhoop kinare, era.. Dunno why but i kept thinking of Khalida riyasat..
Re Tum Ho Ke Chup: Oh defo! that grave scene was spine chilling! If it wasn’t for story going silly in the middle, I thought that drama was brill! I also loved the second wife (the older pushtoon one) That actress had never impressed me much, but I thought here her acting was super! she made me smile everytime! Ive seen very few actors managing to keep up the Pushto accent/dialect/twang Urdu through out. Plus I thought the poetry in the background was so effective. I think if we had that (style) in Numm, that could’ve been so much more effective.. no? And btw, forgot to mention.. I had never ventured with Coke Kahani before thinking it would be an extra long ad.. I was so glad it didnt feel like that at any point! (ok maybe they dropped the name once or twice but it was never a full-fledge hard-talk how great is coke takreer..) I had started watching Rehai at one point but was so put off by the ngo takrir chats that I couldn’t muster the next episode.. Loved the tele-film. Had been very disappointed when A-plus chose not to air it last eid. The way they duped the viewers was disgusting. We kept waiting for the drama to start as ads after ads continued to be aired. However, watching the drama more than compensated for the earlier frustration. I loved the acting by all three. Mansha Pasha gave a brilliant confident performance. Considering she is new and was performing with Bushra and Mohammad Ahmed she was spot on. Must have been a daunting experience but she looked lovely. Mohammad Ahmed and Bushra were soooo endearing. I loved the dialogues. Was smiling through out the play. Specially the sneezing shots 🙂 I do wish Mehreen Jabbar would start something on the lines of ‘ Kitni girhaein baqi hein’ or ‘ New york kahanian'( I hope that was the name of the series) whereby we could see a teleplay each week , with the difference that it would not be heavy stuff but soft witty comedy plays such as the one she has just offered us. The success of ‘ Aun Zara’ should wake up the networks towards what is appealing to the majority of the audience now. This telefilm was a breath of fresh air indeed. I’ve always enjoyed MA and BA, and what a source of pride for the next generation of great dramatic actors is Mansha Pasha. I found her flawless delivery here the best of all. Of course MJ’s direction is spot on and the writing had that old-school wittiness to it for sure. A nice treat all around! Hi SZ. Wonderful review. Thanks. I finally got time to watch Ghoongat. It really is a gem. Enjoyed all the performances. Dialogues were simple but witty, direction was zabardast. The older couple reminded me of my own parents, ha ha. This is the only Eid telefilm I watched. I usually run away from Ramadan serials & Eid telefilms *rolls eyes*….can you blame me? @Mona: So glad you enjoyed this one 🙂 LOL! No, not at all! I so agree with you on running away from Eid telefilms …. seriously, even their names are so off-putting! @Rehmat: Hey girl, welcome back! Glad to hear from you and good to know you are back to watching dramas and are catching up with all the stuff you missed 🙂 So agree with you on the beautiful use of the Urdu langauge.. not just by the writer, but the actors as well! @Masooma: Sorry, didnt realize hadnt responded to you.. apologies! Thanks for reviewing this telefilm. Have started watching Pakistani shows less than a year ago. Whew! what a refreshing change from Bollywood. I am so envious that your Pakistani film makers actually consider Pakistani audiences intelligent. I love that in many shows women are not over made-up, over-dressed and over-sexualized. Confession: Zindagi Gulzar Hai was my first Pakistani show. Ghunghat was wonderful. I laughed out loud. Great acting. It was nice to see a working class family. Most of the Pakistani shows I’ve seen so far, the stories have been about fabulously wealthy people, flying in an out of the country etc. And finally, yes, enjoyed the lack of constant background music. That’s one of my pet peeves about these shows. That said, I should add one of the things I enjoy. I love that some of the visual frames are very aesthetically pleasing and artistic. It’s amazing given that these productions are for the small screen. Thanks DR&Rs for all your Youtube videos. @JR: hey glad that u r liking Pakistani plays..
@Atty Thanks for the tip. Will surely check it out. @JR: Welcome aboard – Lovely to hear from yet another Pak drama afficianado! Yes! If you hate the loud background music that we seem to have in every other serial, then you really have come to the right place 🙂 Thats one of my constant complaints.. btw, this telefilm too had a background score, and from what I hear not a great one, but the version that I had was a pre-edit/raw version hence no bgs … and thank god for that! Agreed, some of our direcors do stunning visuals, dont know if you’ve watched Talkhiyan & Pehchan, but def worth a watch if for nothing else, then just the framing! Also Mehreen J (dir of Ghoonghat), Sarmad Khoosat (dir. of Humsafar) and Haissam Hussain (Durr-e Shehwar & Dastaan) do an exceptional job. @SZ. Thanks for the welcome and more suggestions. I must say I discovered Pakistani shows because I reviewed a book on Indian Soap Operas [Cultural Anthropology] a couple of summers ago when for the first time I had to sit through Bollywood TV productions; [which I never had patience for before.] I found that there were hardly any Muslim characters or shows – completely invisible. I had to search and found a couple of old shows from Doordarshan. Since then of course, there are Qubool Hai and Beintehaan. That’s how I found Pakistani productions. One of the things I love is that the characters have depth and are complex. They are not idealized the way they are in Bollywood. Of course this might have something to do with epic traditions [where Rama is Maryana Purshotamma i.e the Ideal Man]. I recently saw Noor Bano and while it’s the same triangular plot, I found the characters fascinating [not just black or white] and the story-telling interesting with some surprising twists. Would love to read what you thought of Noor Bano if you’ve reviewed it. I am loving this newly discovered genre: the telefilm!